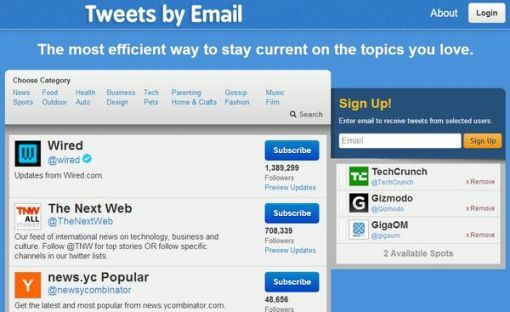 Tweets by Email is a service that allows you to stay up to date on any issue in question through Twitter or know that is what a person or company publishes, via email. All you have to do is subscribe to a source of information and thereafter begin to receive tweets from that source by email, once a day. The sources of information are organized in groups and when they subscribe may do so 5 sources only by each group. They can also search for information sources via search service. Once subscribers can choose the days of the week want to receive emails or also have the option to be able to suspend the emails.